Looking "where to sell my Shelby Cobra Daytona?" Ask the Chicago Car Club! Are you wondering "where to sell my Shelby Cobra Daytona ?" The Chicago Car Club is interested in classic cars of all makes and models, especially a Shelby Cobra Daytona. 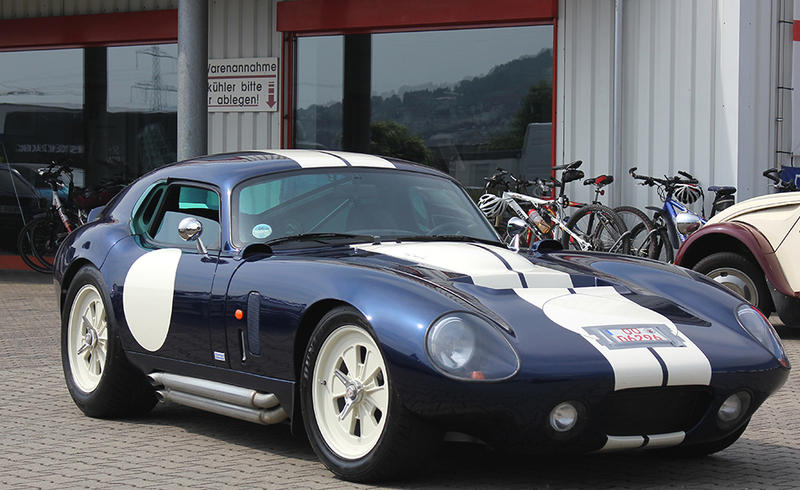 We make the process of selling your Shelby Cobra Daytona quick and painless. In just a matter of hours we will have your classic valued and, if you do so choose, turned into money in your pocket. All it takes is a phone call or electronic inquiry to get the ball rolling. The Shelby Daytona Cobra came into existence for the sole purpose of beating Ferrari. Shelby was determined to win the 24 hours of Le Mans. Carroll Shelby asked Peter Brock to create a race car that could do just that. The Daytona Cobra only raced for two seasons, and at a limited number of tracks. It beat all others in the GT racing class in Le Mans in 1964 (it took fourth, overall) and in 1965 won eight of the 11 races it entered. The Daytona Cobra was the first and only American-made car to win the World Manufacturer’s Championship for Grand Touring race cars. July 4th, 1965 the Daytona Cobra won the FIA World Sportscar Championship, giving America its first ever win in this competition. There were only six of these monstrous machines ever produced. The Daytona Cobra went from 0 -60 in 4.01 seconds with a top speed of 198 mph. It completed the quarter mile in 12.2 seconds with a top speed of 112 mph. All six originals were built just for racing with none sold publicly. In July 2015, Shelby American announced that they would produce a limited run of 50 continuation Daytonas. This limited release was to celebrate the 50th Anniversary of the Daytona’s win at the 1965 FIA Sports Car Championship.